Lovingly tucked inside the handmade, hand-dyed organic cotton bag. 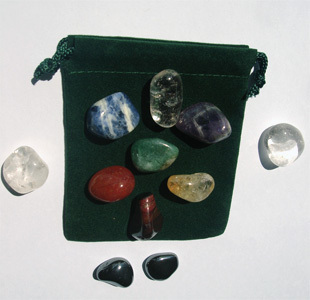 Includes a gemstone information card. Lovingly tucked inside the handmade, organic cotton bag. 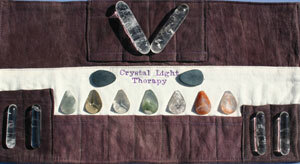 This set includes an information card, instructional booklet & the Crystal Light Therapy CD: A Guided Meditation & Journey. Comes in a velvet bag with an information card. 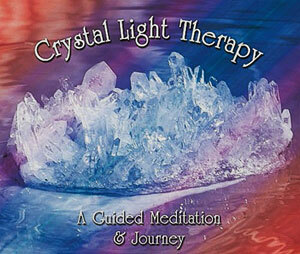 This set includes the Crystal Light Therapy CD: A Guided Meditation & Journey. 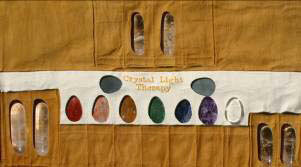 This CD was created to offer Crystal Light Therapy and the energy of the crystals in the comfort of your home environment. Listen to the calming energy of Patricia’s voice as she guides you on a meditative journey through the energy centers of the seven major chakras. The meditation is combined with the beautiful celestial music of renowned musician Michael Moon using natural instruments and crystal bowls. 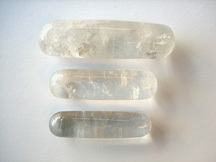 Clear quartz crystal is a pure and powerful energy source. 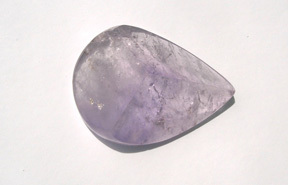 This universal stone receives, activates, stores, transmits and amplifies energy. It is able to bring harmony to the soul, making it Ideal for use in a Crystal Light Therapy treatment as it activates all levels of consciousness. 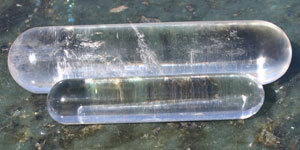 It is said that the ancient Atlanteans utilized the power of Lemurian crystals. 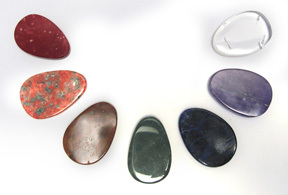 These high vibrational stones have the capacity to retrieve information that will help your clients to solve problems in their current life. Lemurian crystals activate your "soul star" chakra, which is the point where spiritual energy and Divine love, enters the body. 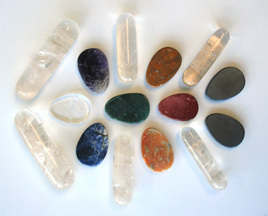 Each colored gemstone is chosen for its connection to the chakra system. 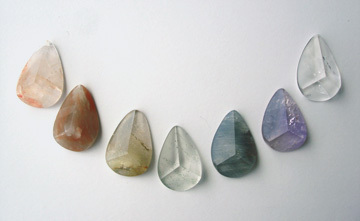 The power of this set is amplified by its faceted cuts, allowing the release of its energy to be multidimensional. Thus, a deeper healing is facilitated on the levels of conscious, unconsciousness and higher consciousness. 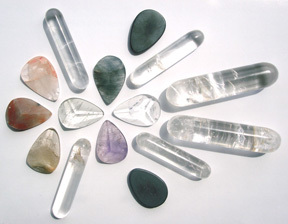 Each colored gemstone is chosen for its connection to the chakra system. The power of this set is in its shape and clarity of intention. 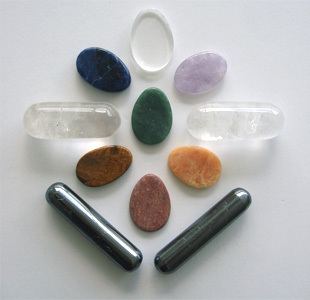 These stones desired to be part of a Crystal Light Therapy healing and work to promote a greater harmony in the chakra system. 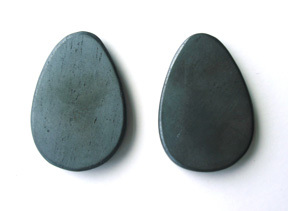 Hematite connects us to be present in our body. 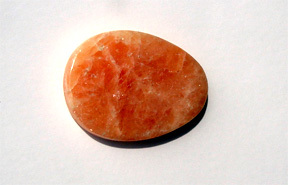 This stone increases security, stability and courage. It is adaptable and helps to dissolve negativity. 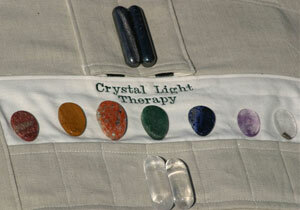 Ideal for grounding and keeping clients safe during treatment. Feathers symbolize spiritual evolution to a higher plane. Using feathers to cleanse one's aura, helps a person ascend in their consciousness. Combined with Aura Cleanser or sage, lower frequencies in one's aura can be quickly and easily released. Sage is used for clearing negativity both inside and outside ourselves, and our space (home, office or any other type of structure where cleansing is needed). One of a kind, these shells are made-up of pearly layers and are used to house the burning of sage. 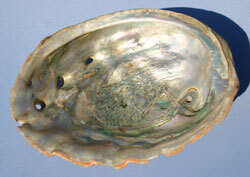 Abalone is said to represent the tides of emotion and therefore assist with the release of feelings during a treatment. Welcome. We are Marilyn and Tohmas Twintreess, co-creators (with our Spirit family) of AhhhMuse. As Spirit Listeners, our job, our service and our joy is Listening to the voices of the Animal, Mineral and Plant Kingdoms. This has led us to co-creating with Patricia, these magnificent, authentic and evolutionary Sets for use with Crystal Light Therapy and also for personal use. Our specialty in this co-creation, first of all, is to Listen to the crystal to determine that these Sets actually wanted to be made and distributed from the Elementals and the Mineral Kingdom themselves! Once we received their thumbs up, we were off and running with our full visionary capabilities and rooted and grounded fingers and toes! These Sets are extremely unique, you might say almost impossible. From the start, created only with total respect and clarity in Listening to and then Manifesting the exact wishes of the Mineral Kingdom, we have honored that process in every step along the way. This requires a large investment in time and energy to find exactly the correct Stonebeings and to find exactly the correct humans to mine them, cut them, ship them, package them and get them to you. You get the picture. This is the ongoing space we hold and manifest and is the heart of our business. These specific Stonebeings asked us to make a fabric bag to store and carry them in that would be made of either organic cotton or silk. We have done so, including dyeing the cotton ourselves with tree dyes. It is important to realize that this honoring is an evolutionary practice that brings great benefit to all of us, the Stonebeings included, as they then get to live in their chosen home in the way they wished. We here in AhhhMuse continue to always hold the space of respect and honoring for these Sets and their components while here, waiting, being assembled, being shipped and being loved. It is a 24/7 space that continues to create itself exponentially due to the practices imbued upon it and with it. There is no replacement for this way of “doing business” in these important times upon this Earth Mother. If we are to really and respectfully take our daily lives and our technologies with us into the new paradigm (and it’s already here) then it is our responsibility to do old things in new ways now and trust that our courage and open-heartedness will carry us through to the new ways that are supportive of ALL the Kingdoms that inhabit this beautiful planet. So we start here, as always, choosing to manifest our co-creations as respectfully as possible and honoring all participants. We invite you to FEEL these Sets and to FEEL what is embedded in them, and then to journey on your own adventure knowing you have our full love, respect, compassion and support for your uniqueness and how you choose to manifest your own individuality. Why do these Sets work so exponentially well? How could they not! Enjoy and remember that live tools that really are effective always take us into the unknown and always require a little more trust and courage than we may have thought was possible. Journey on! It is that trust and courage that forms the new Earth that we all envision as happy and healthy and respectful of all the Kingdoms, including the human species.